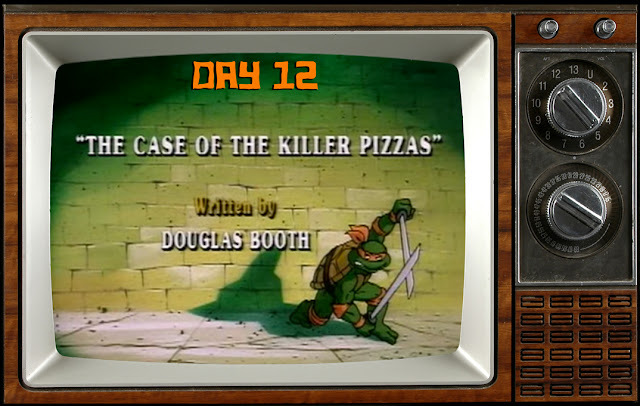 Order the works on Day 12 with Case of the Killer Pizzas from Season 2! Krang presents Shredder with a batch of "eggs" from Dimension X (that look like meatballs). He uses the weird weapon in an attempt to defeat the Turtles once and for all! But naturally, the strange eggs end up on pizzas around New York City. When April and Irma reheat their pie in the microwave, the meatball-like pod hatches. A creepy alien nuisance emerges, causing immediate mayhem. Once the creatures hatch, Case of the Killer Pizzas becomes a much creepier tale. The bright outdoor setting suddenly shifts to the dark and spooky sewers. The deadly monsters lurk in the shadows, hunting down the Turtles. 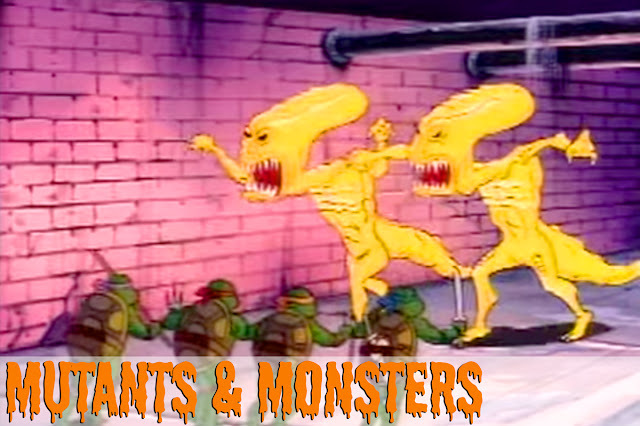 The episode is a mash-up of all your favorite creature features. The Xenomorph-like monsters from Dimension X are a not-so-subtle nod to the film Alien. There's also a lot of connections to pesky monster movies, like Critters & Ghoulies. 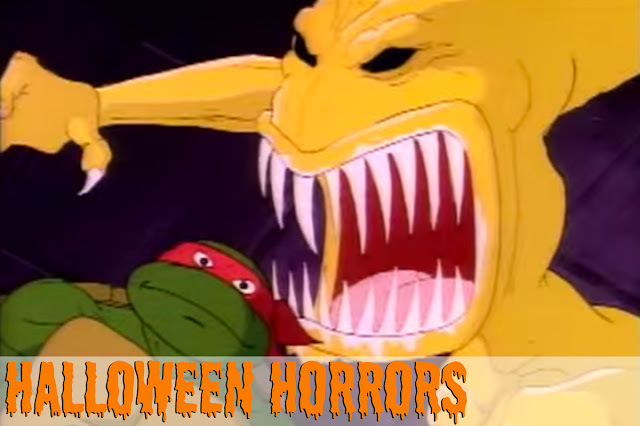 Sure, Shredder and his gang are fun adversaries, but it's a Halloween-treat watching the Turtles battle against these horror movie villains. Why didn't they ever make toys of these frightening foes?! When the creatures grow from pesky critters to giant monsters, the episode's audio gets really bizarre. The musical score and the aliens themselves combine to make a chilling sound, unidentifiable sound. Its reminiscent of a Ghostbusters, Zuul-like noise. It makes your skin crawl. 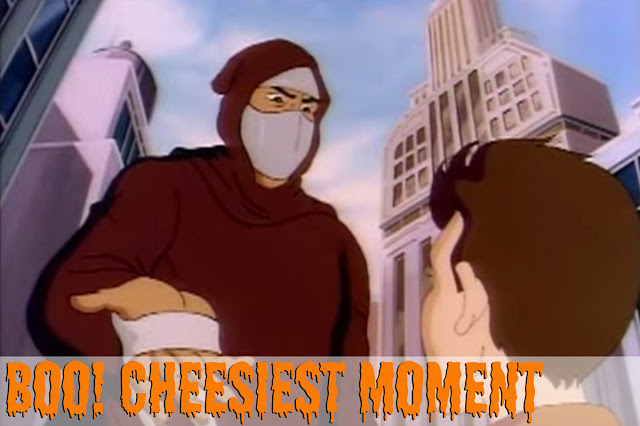 Shredder struts his stuff in the streets of New York wearing a stupid, brown cloak. I guess this is an attempt to keep his identity a secret, but man, you're a ninja! This is the best you could come up with? He looks like a sad friar begging for change. Com'on Shredder, you're a villainous warrior. Act like it, dude. In TMNT lore, Case of the Killer Pizzas is an iconic episode. Its amusing title and horror movie plot elevated it to become a classic. It's one of those early episodes where the show had yet to find its footing. The uneven pacing, slightly off voice acting, and animation make this an even better Halloween viewing. It's a Turtle Twilight Zone kind of episode. The outlandish quirks only add to its spooky charm. Check back tomorrow for Day 13, the final entry of Horrors In A Halfshell! You know, I thought I had seen a lot of episodes of TMNT, but I don't think I caught any of the episodes you showcased so far. I think I might have to go searching for the box set, so I can catch up on the ones I missed.